Performers include: Geoff Stults, Chris Lowell, Parker Young, Keith David, and Angelique Cabral. This single-camera comedy series revolves around three brothers and a group of misfit soldiers on a small Florida Army post. Staff Sergeant Pete Hill (Geoff Stults) is charming, funny and a natural-born leader. He was on a path for a huge military career until one mistake overseas (he punched his commanding officer) got him booted stateside to Fort McGee where his two younger brothers are stationed. Now their platoon sergeant, Pete must serve both as big brother and military boss. Corporal Derrick Hill (Chris Lowell) is the middle brother. He’s too smart and sarcastic for his own good and likes to stir up trouble. Private Randy Hill (Parker Young) is the hyper-enthusiastic and very goofy youngest brother who wants to be the gung-ho “G.I. Joe” military ideal. The Hill brothers all serve in the Rear Detachment (Rear D) unit. It’s comprised of the Soldiers left behind when everyone else is deployed. They mow lawns on post, sort mail, wash tanks and find lost dogs. However, the Rear D’s main job is taking care of deployed Soldiers’ families. Whatever they need, the Rear D Soldiers do. It’s a job that shifts each moment from the thrilling to the mundane to the emotional and back again. Fort McGee Rear D is run by Command Sergeant Major Donald Cody (Keith David). He’s a firm but fair man who served with the brothers’ late father. Cody promised to look out for them, so he brought all the brothers to the post to fulfill that promise. Cody has seen it all and lost a foot to prove it (a fact no one can forget, since he never misses an opportunity to bring it up). Also under Cody’s command is confident and beautiful Staff Sergeant Jill Perez (Angelique Cabral). She’s the same rank as Pete and leads another Rear D platoon on post while challenging Pete’s decisions at every turn. Between clean-up duty at a parade, human-grease-bowling and assorted soldier pranks, the Hill brothers inadvertently discover the key to strengthening their long-lost childhood bonds. The Hill brothers celebrate Pete’s one year anniversary of almost dying in Afghanistan, otherwise known as his “Alive Day.” After the funding has been cut for the annual ball, which was going to honor Major Cody, Pete enlists the platoon to create their own ball to honor him. First aired: June 22, 2014. What do you think? 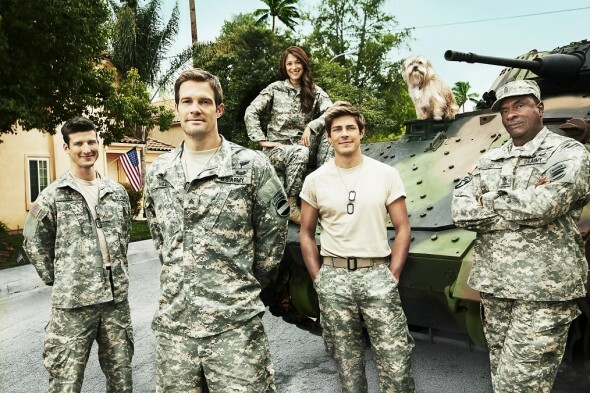 Do you like the Enlisted TV series? Do you think it should have been cancelled or renewed for a second season? I loved this show! Please bring it back! I loved this show, huge fan of Chris Lowell from Private Practice and Veronica Mars, and of course Geoff Stults as “The Finder”! It’s sad to see you go, Enlisted was and will always be out-fing-standing!! I really enjoyed the show and I’m sad it’s canceled! My grandma and I watched this show together and loved it. Always great laughs. Loved it!!! Should be saved!!! please bring back enlisted. I love the show !!!!!!!!!!!!! Love Enlisted!PLEASE Bring it Back! I just found out about this show, no wonder it was canceled. I love it bring it back. I love Enlisted , please bring it Back !! !